Something from Habakkuk to Remember. Do you see what God was doing there? He was giving the prophet Habakkuk His word that He is using the pagan Chaldeans for His purposes. He was raising them up to use as judgment against His people. Israel had rebelled and neglected God’s word as revealed through the prophets. Make sure to read the last part of verse 11, “But they will be held guilty, They whose strength is their god.” The Chaldeans were going to be held accountable by God in His justice. 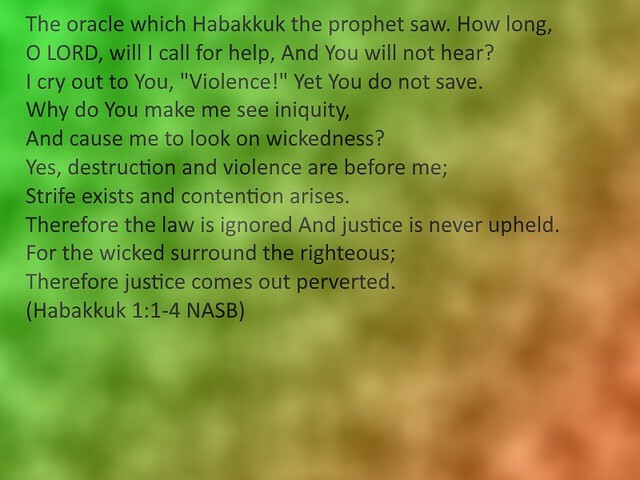 At first it seems that Habakkuk understands why God is going to punish Israel, but then he goes on pleading with God. His questions seem to call for God to not allow this to happen. Sometimes we can be like that. We live in a great land. Many of us are like the Chaldeans. We put our faith in the strength of our military, or our wealth. We trust a nationalistic ideology called America. We offer our sacrifices to it. We neglect God and His word. We rebel against Him. We kill our young and call it a woman’s right to choose. We make legal all types of perverse abominations and call it progress, and liberty. Just because we legislate it and make it legal does not make it moral. Just because a secular majority deems something to be good doesn’t make it so. As Christians we have an external moral authority Who is immutable. He never changes and is eternal. His decrees of good and evil stand for ever, no matter what human government makes legal. The political candidates we have to choose from, the debased minds that many of our fellow Americans have, the perversions that are abounding, are all punishments from God. We are under judgement. We need to be outside of our Churches, evangelizing so that people might be saved and come in. We need to repent of our personal sins. We need to repent of the attractional model of Church. We need to stop begging goats to come in to our Churches. We need to go out to them and preach the gospel of Jesus, which is repentance from sin and faith in Christ’s work on the cross. When people are miraculously changed by God they will become sheep. They will come to Church without the need of the gimmicks of silly centers. They will hunger for the preaching of God’s word, fellowship with brothers and sisters, praising God with hymns, prayer, and the glory of God will be their aim. Don’t be bashful, now is not the time. Be bold for Christ and His gospel to go forth! Are you saddened by the damage and hurt you see being done by sin in the lives of your friends and neighbors? Do you think that you love them? If you do, then you must give to them the only cure for their brokenness. You must give them the only thing that will heal them and make them whole! Give them the gospel of Jesus! It is truth and love! So if you find yourself crying out to God much like Habakkuk did, ask yourself why God is doing what He is doing. Ask yourself what the proper response is to what He is doing. Then I think you will come to the same conclusion. Excellent article. Our only hope is to evangelize, evangelize, and evangelize some more!